Serve once a month during the Contemporary Service leading preschool age children in Bible Study, music, and learning activities. Preparation includes training in the use of Tru curriculum, which is provided. Lead one unit of Tru curriculum, which includes The Big God Story and response activities for elementary age children during the Contemporary Service. Training provided. The Nursery is in need of workers during the Sunday School hour and the Contemporary Service. Our littlest children would love to see you! No prep needed; all that is required are some loving arms. We are looking for adult and high school workers. Please indicate if there is a particular Sunday that you would like to work. During the MOPS program, volunteers are needed to care for children (birth-age 5) twice monthly, 9:30-11:30 a.m. Volunteers tend to the babies and guide play activities. No teaching or preparation involved. A Bible story teacher and music time teacher are provided for each classroom. 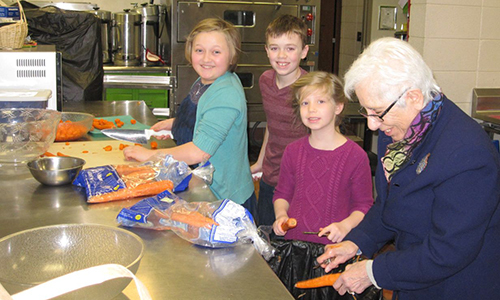 Serve with three to four volunteers per classroom. Bring 100 cookies, muffins or sweetbreads (home-made or purchased) to be served at the Sunday morning coffee hour. Please sign up on the bulletin board behind the Welcome Center. Help with coffee time on Sunday morning for set-up (8:15 to 9:30) or clean-up (10:45 to 11:45) once every four to six weeks. You will work with other members who will help to train you. Greeters are needed to welcome those attending the Sunday Traditional Services as they enter the church. Station yourself at the main doors. Begin 20 minutes before the service of your choice. Staff the Welcome Center in the Narthex on Sunday mornings. Answer questions and give directions to nursery, restrooms, Sunday school classes, etc. 15 minutes before and after the service of your choice. Setting up for the service, greeting and seating people before service, handing out bulletins, and taking offering. Edit PowerPoint presentation while worship team rehearses and then click through the presentation during the service. Must know how to edit PowerPoint slides and how to move forward and back through the presentation. Limited training available. One Sunday a month. Setting up and working the soundboard during the service for the band and speakers. Make and set-up refreshment centers to create a welcoming atmosphere. Read the Sunday morning Scripture lesson on a Sunday convenient for you. Adults and youth are welcome to read. Scripture passages are provided to readers in advance. Volunteers are needed during the school year. This position rotates with a cycle of one month on, two months off. Will train, but some knowledge appreciated. Lots of flexibility! We need a few good seamstresses to inspect the children’s choir robes, make repairs (torn hems, ripped seams, etc.) and take them home to launder. The robes are machine washable and dryable. Do not require ironing.